At one point in Cincinnati’s history, the city had the largest electrified transit network of any city its size in North America. A good deal of that network consisted of 220 miles of streetcars running all throughout the city, and now city leaders are working to introduce a modern streetcar system in Cincinnati. The Cincinnati Preservation Association (CPA) would like to show off the proposed modern streetcar route to those interested, and discuss the positive impacts such a system would have on the city’s historic building stock. Artist rendition of modern streetcar on Race Street in Over-the-Rhine. Warminski says that at the recently held Cincinnati Neighborhood Summit speaker after speaker said the same thing about the important value of walkability and access to transit to improve neighborhoods. 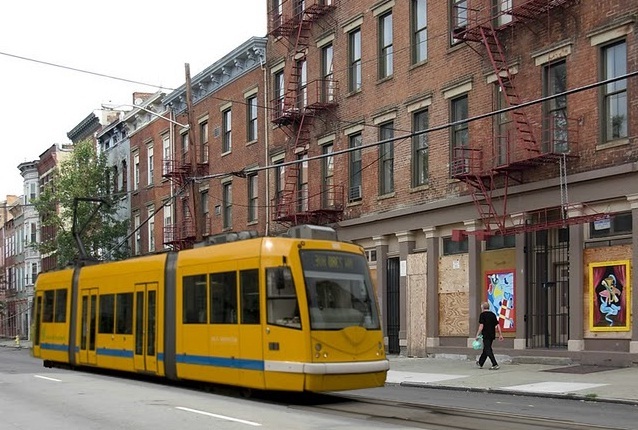 And the CPA believes that projects like the Cincinnati Streetcar help to promote that vision, while also presenting exciting revitalization opportunities. Those interested in participating in CPA’s Walk the Streetcar Route, can do so on Saturday, April 30 from 9:30am to 12pm. Margo Warminski will lead the walking tour, which will meet at Vine Street and Central Parkway (map), and show off the development opportunities present along the Cincinnati Streetcar route through Over-the-Rhine. A $5 donation is appreciated, and go towards supporting CPA’s advocacy and outreach efforts that include the Gamble House, Our Lady of Perpetual Help, Oakley Train Station, Village of Greenhills, monthly educational programs and other projects.